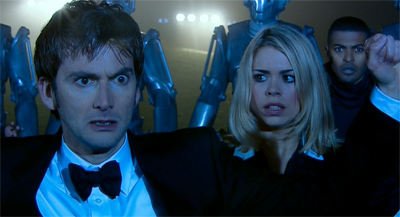 Rise of the Cybermen originally aired in 2006. I’ll freely concede that I am sceptical of the Cybermen. Okay, that’s not fair. I actually really like the early Cybermen stories. However, it seems like Doctor Who really forgot how the Cybermen worked when it turned them into a recurring “once per Doctor” sort of threat. However, they are part of the show’s iconography. The image of the Cybermen marching down the steps of St. Paul’s Cathedral from The Invasion is important enough to earn them a sacred place in the show’s history. 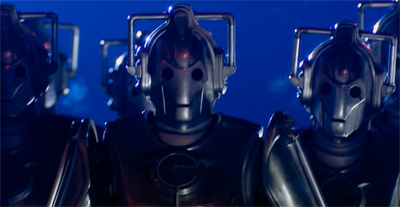 So the return of the Cybermen was inevitable, even before we caught a glimpse of one of their silly helmets in Dalek. 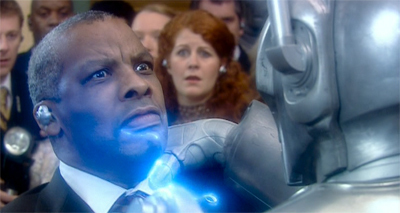 Russell T. Davies has generally done a great job revitalising old concepts for the revived series, so Rise of the Cybermen has that in its corner. Unfortunately, I’m not convinced that Rise of the Cybermen approaches anything resembling the quality of Dalek, and I think that Rise of the Cybermen manages the rare feat of turning most of Davies’ strengths into weaknesses. Since the show came back, we’ve been primarily focused on Earth. Indeed, all the stories in the first season of the resurrected Doctor Who took place on (or around) Earth. 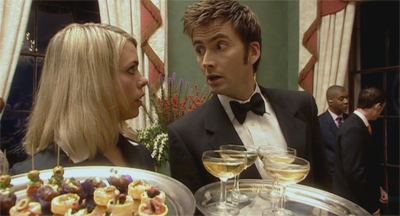 The furthest we’ve ventured away was in the episode directly prior to this one, The Girl in the Fireplace. However, even in that adventure we were firmly anchored to terra firma. We wouldn’t get a televised extraterrestrial adventure until The Impossible Planet and The Satan Pit, the second two-part adventure of the second season. Now, to be fair, this approach has its advantages. As a rule, Doctor Who tends to drift closer to and further away from Earth at various points in its history. For example, the Barry Letts era was very firmly focused on events on Earth. Similarly, the last year of the classic show was anchored on the planet. In contrast, there were also extended periods where the Doctor would travel without a companion from Earth and with no real tether to the “real world” of the modern day planet Earth. Davies very clearly favours the idea that the show should be based around the modern world. And there’s nothing wrong with that. In fact, I would argue that a significant amount of the show’s success following the relaunch can be attributed to Davies’ decision to centre the storytelling around modern-day Earth. Like his decision to de-clutter the mythology by starting from scratch without unnecessary complications like Time Lords and a regeneration scene, it makes the series accessible. It makes it something that people can tune into a watch on a casual basis without too much excess baggage. Of course, any decision of that sort is going to have a weakness or two. There’s no such thing as a perfect model for Doctor Who. After all, that’s why it continually reinvents itself. Whether or not a particular approach to the show works is ultimately down to the person watching, and it’s an aesthetic call as to which mode of Doctor Who you prefer. Davies’ firmly grounded version certainly has its strengths, but it also has its weaknesses. And Rise of the Cybermen is perhaps the best example of those weaknesses to date. See, Rise of the Cybermen is effectively an origin story for the Cybermen. Like Dalek, it draws heavily from the material produced when the show was off the air. In this case, it’s the audio play Spare Parts. To be fair, the idea of televising an origin story for the Cybermen is brilliant. I think the best portrayal of the Cybermen recognises that they were once creatures like us that made a particular evolutionary decision at one point and became monsters. They’re a twisted distorted mirror of humanity. That’s one thing that I think Star Trek did with the Borg better than Doctor Who has done with the Cybermen in quite some time. So going back to their roots makes sense. As does the point of stripping down their back story and mythology. The Tenth Planet is a product of its time. The concept of a dark twin planet in our solar system just isn’t going to fly on Saturday night telly, and that’s before you get into the grotesque continuity-restructuring that we had with Attack of the Cybermen. While the Daleks were a simple concept with a solid arc behind them, the Cybermen have become a muddled mess of a monster and throwing all that out was a good idea. As was, to be honest, redesigning them. The Dalek design is iconic enough that you can’t really change it. Indeed, Davies fought tooth and nail to keep that design consistent between the classic and the revived series. However, the Dalek design is elegant in its simplicity. 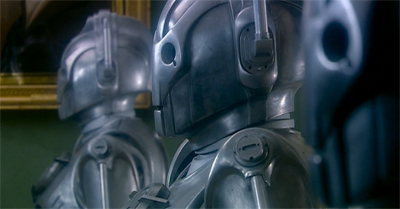 The Cybermen design… is not. Again, I actually prefer the uncanniness of the cloth design in The Tenth Planet or the “bucket head” from The Moonbase over the more recognisable appearance from The Invasion onwards. However, the Cybermen from the classic series look like they should be appearing on Bananas in Pyjamas. They even have permanent frowny faces. So the design for the Cybermen was necessary and – to be honest – it’s the best part of this whole two-parter from the point of view of the Cybermen. It’s powerful, it’s intimidating and it’s absolutely massive. 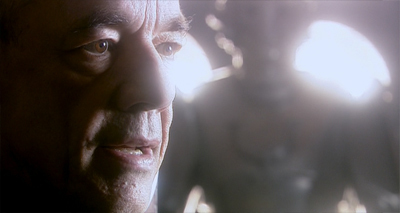 Director Graeme Harper does a phenomenal job here, hitting on the idea to shoot the Cybermen from low angles in order to make them seem more intimidating. The scene of the Cybermen crashing the party is a beautiful sequence that is effectively handled. That said, I am not convinced they needed a catchphrase. Giving them “delete! delete!” seems to concede that the best the Cybermen can ever hope to be is sort of second-rate Daleks. That feels like it’s selling the concept a bit short. Not that I think they’d ever supplant the Daleks, but so consciously and rigidly emulating them feels like a mistake. It’s trying to make the Cybermen conform to an archetype, rather than organically developing them. And what the hell is “maximum deletion?” It isn’t as though there’s a sliding scale and the people inside the party were only partially deleted. However, the real problem comes when you try to bundle all this up with the show’s attachment to the real world. Obviously there are some stories you can’t tell in modern London, because they simply won’t be modern London at the end of it. 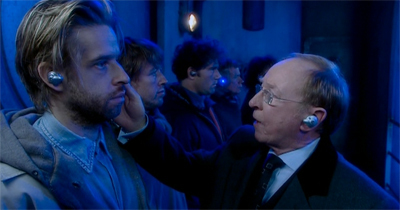 Davies runs into that problem quite a bit from the second season on, as we discover that smashing Big Ben and killing Tony Blair are the limits of his ability to deviate from reality without creating a modern London in Doctor Who that is completely unrecognisable when compared to the one in the real world. 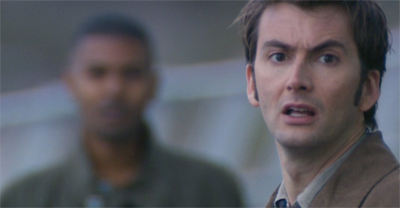 So the Dalek and Cybermen invasion in Doomsday gets handily reversed before any real damage is done. The Master’s occupation from The Last of the Time Lords can’t be allowed to stand. Similarly, you can’t have the modern-day planet Earth give birth to a race of Cybermen and still have it appear to be anything like modern-day planet Earth. It breaks that connection the show has been fostering so carefully. And so Doctor Who tries to have its cake and eat it. Presented with the urge to do an origin for the Cybermen and remain anchored in “the real world”, the show decides to pull a bit of a cheat: we’ll see an alternate modern-day London give birth to the Cybermen. And the concept stretches so far that it almost breaks. It’s a cheat. It’s a cheat bigger than the handy “reset buttons” used to avoid the consequences of Doomsday and The Last of the Time Lords. By setting it in an alternate world, Davies and writer Tom MacRae get to imagine a world that is both the same and different. The only problem is that they need to explain how it is different and yet still remains the same. How much of Rise of the Cybermen could happen in our world? Why doesn’t it? Might it still? In fairness, it’s fairly obvious how the world is the same. All the trappings are there. It is shot in modern-day Cardiff, dressed up to look like modern-day London. People still drive cars. The landmarks are present and accounted for. People still wear suits. There are still homeless people, there is still a difference between the rich and the poor. There’s arguably the same fixation on technology. In short, the world of Rise of the Cybermen is superficially quite similar. However, there are also differences. Some of these are simply cosmetic. 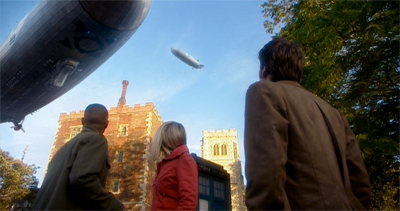 After all, zeppelins are more cool than practical. However, there are some fundamental differences that the adventure glosses over, because it is very clearly concerned about drawing attention to the fact that this is not a very close approximation of the real world. Why bother having a parallel world if it’s not going to appear familiar? So we get a bunch of fundamental differences that the series glosses over. Apparently this version of Britain is a police state. It has a President rather than a Prime Minister. There is a military curfew in effect. People are disappearing off the streets. Apparently the zeppelins are systematic of a more rigid class structure. “Where you been living, mate?” one of the soldiers asks Mickey. “Up there with the toffs?” These are fairly significant differences between our world and the world as seen in Rise of the Cybermen. However, most of Rise of the Cybermen downplays those differences, even though – based on the social structure and the level of technology on display – there is no reason why the world in this episode should look so much like our own. The only reason it does look so similar to our own world, with Rose and the Doctor wandering through the city centre as they would in any other episode, is because Davies’ version of the show is so firmly anchored in a world that looks and feels like our world. That’s the biggest problem here – the attempt to fit a round peg in a square hole. Or a Cyberman origin story in contemporary London. On second thought, maybe he doesn’t need a moustache so much as a pantomime cape. Later on, he calls up the President for no other reason than to do some bad guy gloating. “Mister President. I suppose a remark about crashing the party would be appropriate at this point.” The Cybermen were such great concepts because it’s easy to imagine a society doing that to themselves. In theory, it’s easy to understand Lumic wanting to live on, but the script reduces him to a cardboard villain. Ironically, Lumic’s two-dimensional villainy sacrifices any of the relatability that keeping the story in the modern world helped secure. I’m generally reasonably fond of the social conscience that Davies infuses into Doctor Who, but Rise of the Cybermen feels a little heavy-handed. 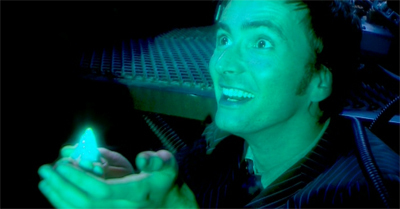 Apparently, based on Rise of the Cybermen, it is physically impossible to be both rich and not evil. 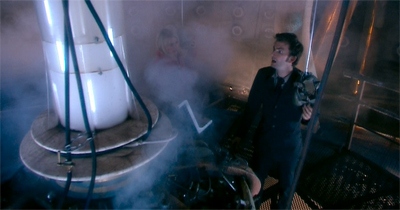 Jackie Tyler, for example, becomes a completely shallow and callous character when she is given wealth. All her negative attributes are apparently enhanced by the fact that she has money, and any positive personality traits are diminished. Indeed, you can tell that Pete is a half-decent guy here because he’s firmly connected to his roots. “I remember her twenty first. Pint of cider in the George.” Apparently he fell in love with Jackie when they were poor, but she became this sort of vicious harpy when he earned a bit of cash for them. It’s lazy writing and it’s downright nasty. It’s not inconsistent with Davies’ exploration of class issues in Doctor Who, but there’s a difference between suggesting that working class people are fantastic and that rich people are inherently immoral. Of course, that exploitation sort of cuts to the nub of why these Cybermen don’t really work as well as they could. The truly terrifying thing about the Cybermen of the Tenth Planet was the idea that they did it to themselves. Some species somewhere decided that they would be a lot better as a mix of flesh and machine, so they opted to “upgrade.” Of course, Rise of the Cyberman acknowledges that we might be a little complicit due to our dependence on technology, but there’s a world of difference between the idea of a species upgrading themselves and some insane megalomaniac assimilating people. The former idea is truly unsettling and disturbing – the idea that somewhere a civilisation decided that this was the next evolutionary leap for them. The latter is just conventional Doctor Who plotting that gives us a handy villain for the Doctor to defeat before the credits role. Rise of the Cybermen feels like it takes the easy way out, and is almost afraid of doing the more difficult (but rewarding) work. Part of the reason that Dalek worked so much better was the way that it worked hard to earn the respect of the audience. There’s just something far too comfortable about all this. 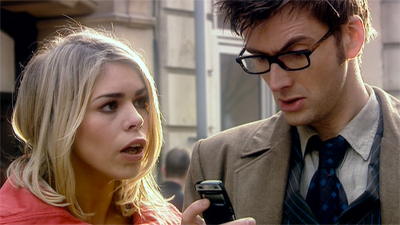 Which is, of course, the continuing problem with Rose and the Tenth Doctor. I know that they are supposed to seem arrogant. Davies has confirmed this in interviews, and their hubris is even explicitly mentioned in Tooth & Claw. However, that doesn’t make their relationship any easier to swallow. They still seem exceptionally cliquish and exclusive. Adding Mickey to the mix just makes it even more obvious. Of course, Rise of the Cybermen does give Mickey a nice character arc and make him more sympathetic, but it also makes it a lot easier to hate the Doctor and Rose for their smugness. When Mickey asks about a story they are telling, the Doctor is – at best – dismissive. “Oh, it was on this er, this er planet thing. Asteroid. 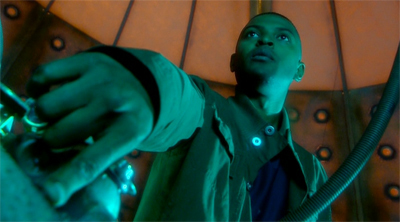 It’s a long story, you had to be there.” When Rose is tempted to visit her father, Mickey quite rightly points out that the Doctor has absolutely no interest in him as a person. “Oh, so it’s just Rose, then? 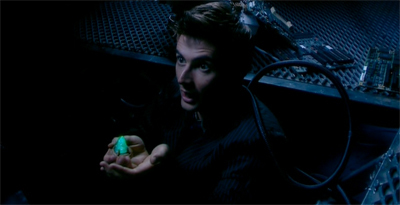 Nothing out there to tempt me?” And, again, the Doctor is dismissive. “Well, I don’t know, I can’t worry about everything.” Just Rose apparently. Of course, we’re meant to agree with Mickey, but that doesn’t make the Doctor’s obsession with Rose any easier to deal with. I liked Rose as a companion in the first season, but the way that Davies uses her as such an obsession for the Doctor is quite frustrating. To be fair, no companion before or since has occupied the character’s attentions as much, but that doesn’t make the second season any less annoying. Similarly, Rose’s jealousy over absolutely any random female character that the Doctor might mention feels like it diminishes her as a character. 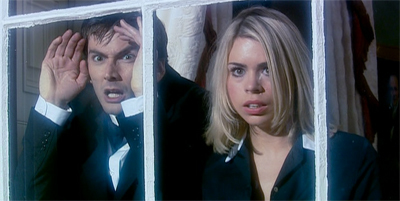 (When the Doctor mentions Lucy mentioned that the UK has a President, Rose bitchily responds, “Or maybe Lucy’s just a bit thick.”) The problem is that Rose really reached the end of her development in The Parting of the Ways, and the second season hasn’t got as clear an arc for her once you get past the first couple of episodes. Of course, all this is undermined by the fact that it’s very clear that even Mickey’s final episode is still all about Rose, really. Mickey is just the trial run. It feels a bit convenient that Rose should stumble into a magic alternate world that has her father alive, and then that world will tie into the big end of year finalé. Not to mention, of course, the fact that alt!Pete’s wife is handily killed off so he can be paired with Rose’s living mother. In many ways, it feels like giving Mickey some much-needed character development is only happening because Rise of the Cybermen needs to make sure the pieces fit together for Rose’s departure. I don’t like Rise of the Cybermen. I think it’s a mess of an episode that really suffers from taking the path of least resistance in doing everything that it wants to do. It’s more of a laundry list than a compelling hour of television, and it feels like a bit of a letdown. There’s a lot of potential here, and some great ideas. Unfortunately, the execution is half-hearted at best. This episode really falls apart once you listen to Spare Parts. Just compare Lumic to Doctorman Allan. There’s a bit of what made Spare Parts effective, but it’s buried under elements that don’t really work.